Lauren Denea Hensley is the 17 year old daughter of Jeff and Tammy Hensley of Charlottesville, Virginia. Lauren is a Senior at Monticello High School and enjoys the Children's Ministry at Northridge Community Church, photography, baton twirling, reading, rock climbing, and watching her twin brother play baseball. Lauren plans to attend Liberty University in the Fall. Christina Elene Branzelle is the 17 year old daughter of Kenneth and Helen Branzelle of Wingina, Virginia. Christina is a Senior at Buckingham County High School and enjoys cheerleading, singing, participating in community activities and Church. Cheryl Lee Koltz is the 17 year old daughter of Patrick Strawderman and Kimberly Koltz of Palmyra, Virginia. Cheryl is a Junior at Fluvanna County High School and enjoys snowboarding, cheerleading, theatre, cooking chili for charity events, and camping with family and close friends. 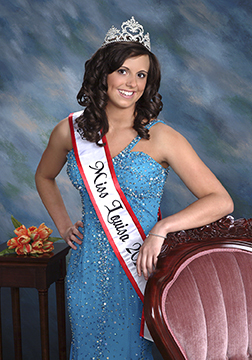 Brittany Leigh Gibson is the 20 year old daughter of Sherwood and Lisa Gibson of Ruckersville, Virginia. Brittany is a Sophmore at Piedmont Virginia Community College and is Pursuing a degree in Business. Brittany enjoys scrap booking, cooking and spending time with family and friends. Kayla Anne Dauberman is the 17 year old daughter of Scott and Amy Smith of Louisa, Virginia. Kayla is a Senior at Louisa County High School and enjoys competition and sideline cheerleading, athletic council, roaring leaders and is a SPCA volunteer. Lauren Ashley yowell is the 19 year old daughter of Jesse and Cheryl Yowell Jr. of Madison, Virginia. Lauren attends Piedmont Virginia Community College and is pursuing a degree in Nursing. Lauren enjoys softball, volleyball, swimming, fishing, shopping, working at their family restaurant, and spending time with family and friends. Lauren Marie Ashby Seal is the 18 year old daughter of Delmer and Elain Seal of Orange, Virginia. Lauren is a Senior at Orange County High School and enjoys playing field hockey, soccer, working in the community, going to Church, and spending time with family and friends. Lauren is certified in CPR, first aid and life guard training.